Young children who got a year of musical training outside school showed brain changes and superior memory compared with children who did not receive the instruction, according to a small new study published yesterday that followed a group of Canadian children. Six children who took Suzuki lessons had larger and faster brain responses to musical stimuli compared with six children who had no lessons, based on measurements by a magnetoencephalograph, a device that monitors brain wave activity. Besides having faster and larger brain responses to violin notes compared with the children who did not get the lessons, the musically trained children showed much more improvement on a test of general mental ability. The study of children 4 to 6 years old is the first to show specific cognitive benefits from musical training among the very young. The researchers studied the effects of the popular Suzuki method because different Suzuki instructors all follow the same steps and because students are not selected on the basis of innate musical ability or mental skills. 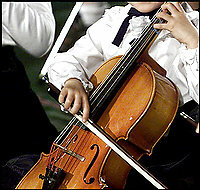 "It is very interesting that the children taking music lessons improved more over the year on general memory skills that are correlated with nonmusical abilities such as literacy, verbal memory, visiospatial processing, mathematics and IQ than did the children not taking lessons," said Laurel J. Trainor, the lead researcher of the study at McMaster University in Canada. The study is being published in the journal Brain.